Tableau Software insiders have sold $66.6 million worth of stock since Tuesday. It's worth taking a closer look at the company with the stock trading at such a rich valuation. A number of insiders have been selling shares of Tableau Software (NYSE: DATA) according to recent form 4 filings. Since August 9th, executives and directors have sold a total of $214.6 million worth of stock which represents 3.4% of the company's total market capitalization. However, yesterday's form 4 filing by Pat Hanrahan (Co-Founder, Chief Scientist and Director) and Christian Chabot (Co-Founder and Chairman) notably caught my eye. The two co-founders have sold a total of $66.6 million worth of stock since Tuesday which is approximately 1.1% of Tableau Software's total market capitalization. Tableau Software provides business analytics software products and was founded in 2003. Management of the company reported Q4'17 earnings on February 1st that easily beat Wall Street estimates. This led to a number of equity analysts either upgrading their rating or raising their target price on the stock. Shares immediately soared and hit a two-year high. Management obviously wants to cash in on this and take some chips off the table as highlighted by the recent selling activity. But does this signal that management is less confident in the company's future prospects? 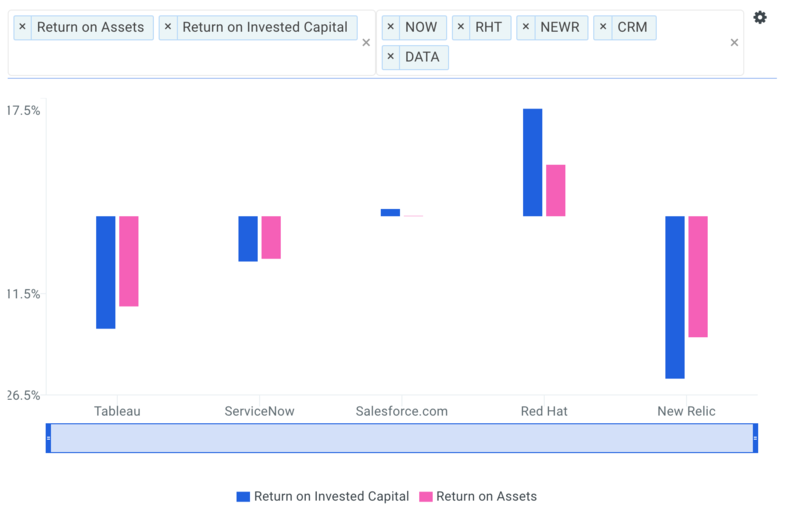 Analysts covering the stock often compare the company to a peer group that includes ServiceNow (NYSE: NOW), Salesforce.com (NYSE: CRM), Red Hat (NYSE: RHT) and New Relic (NYSE: NEWR). 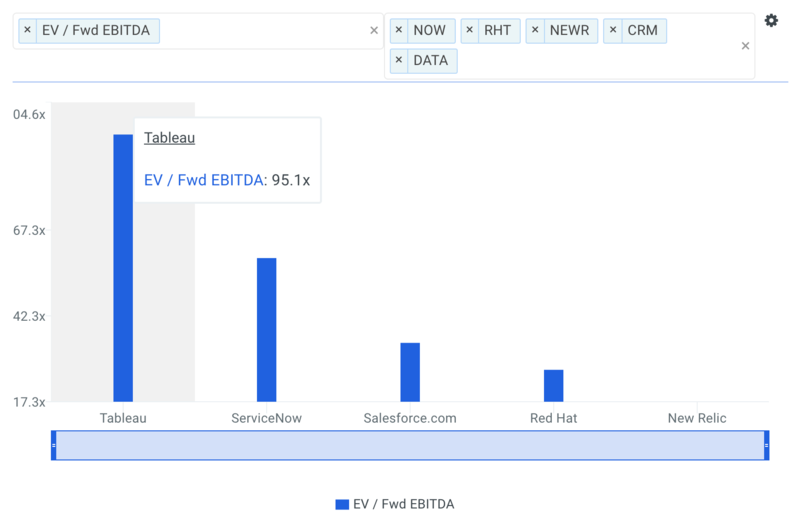 Analyzing Tableau Software's valuation metrics and ratios relative to its peer group offers insight into why insiders may be selling their shares. The chart below plots the five-year revenue compound annual growths for Tableau Software, and it's peers. The company's projected 5-year revenue CAGR of 11.2% is below all of its selected comparable public companies: NOW (29.7%), CRM (19.7%), RHT (13.8%) and NEWR (28.4%). Notice below the company's ROIC of -16.7% is only above NEWR (-24.1%) and below NOW (-6.7%), CRM (1.1%), and RHT (15.9%). 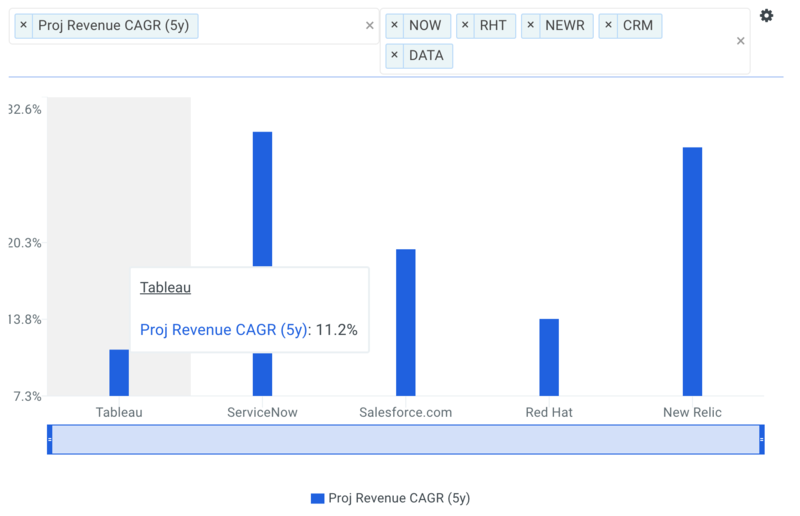 Similarly, Tableau Software's ROA of -13.4% is again only above NEWR (-17.9%) and below NOW (-6.3%), CRM (0.1%), and RHT (7.6%). Although the company's growth prospects and returns are less attractive than its peers, its valuation multiples trade at a premium. The company's shares last traded at $77.75 as of Thursday, up 43.0% over the last year. While the stock has made impressive gains, the recent insider transactions could signal a troubling road ahead for shareholders. In addition to the premium valuation multiples, finbox.io's average fair value estimate of $67.79 implies -12.8% downside and is calculated from 6 valuation models as shown in the table below. 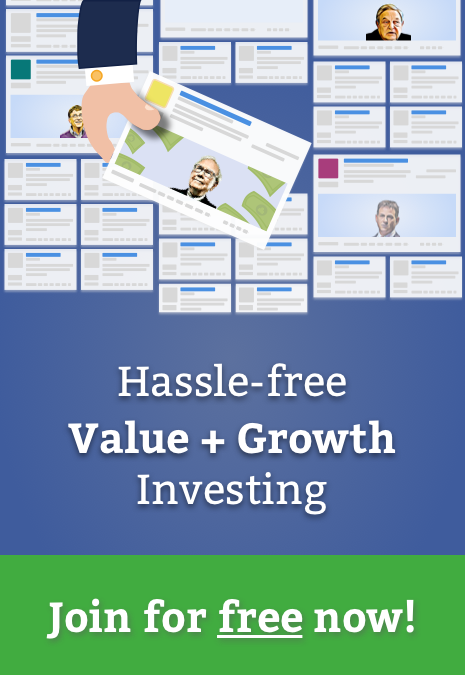 Each analysis uses consensus Wall Street estimates for the projections when available. Valuation: how much upside do shares of Tableau Software have based on Wall Street's consensus price target? Take a look at our analyst upside data explorer that compares the company's upside relative to its peers. Forecast: what is Tableau Software's projected EBITDA margin? 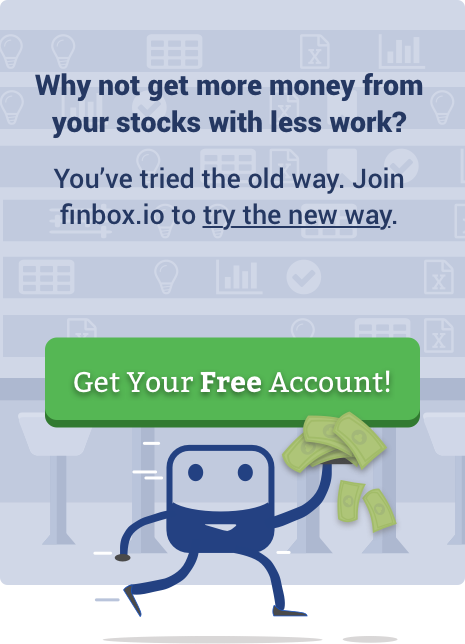 Is the company expected to become profitable in the near future? Analyze the company's projected EBITDA margin here. Risk Metrics: what is Tableau Software's asset efficiency? This ratio measures the amount of cash flow that a company generates from its assets. View the company's asset efficiency here. Next story What's Ken Griffin Of Citadel Buying and Selling?